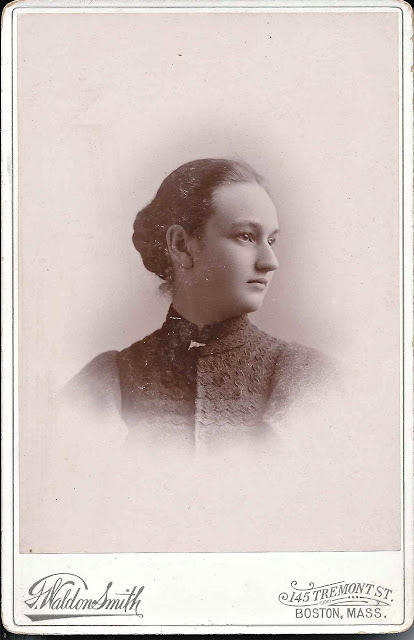 1894 graduation photograph of Lillian M. Pettengill, a student at Haverhill High School at Haverhill, Massachusetts. 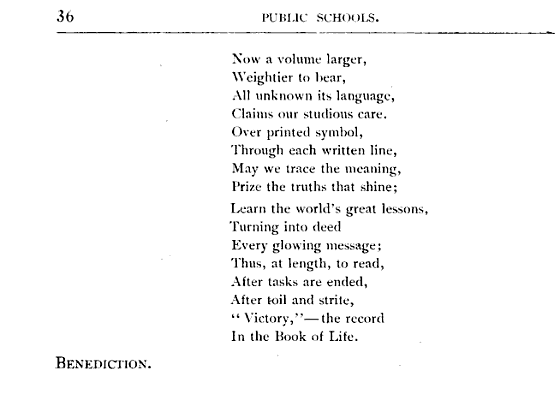 Many records have her name spelled variously as Pettingill, as you will see below. 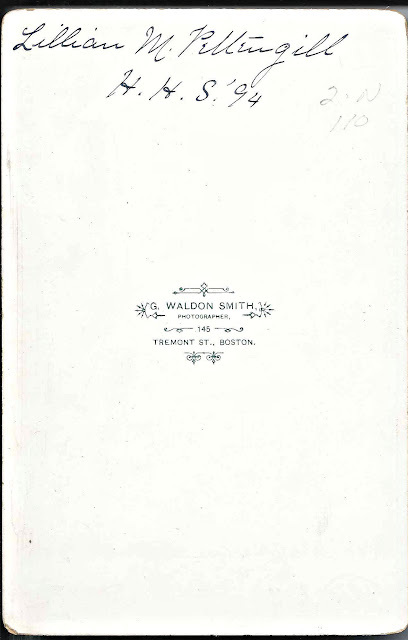 The photograph was taken by the Waldon Smith studio of Boston, Massachusetts. 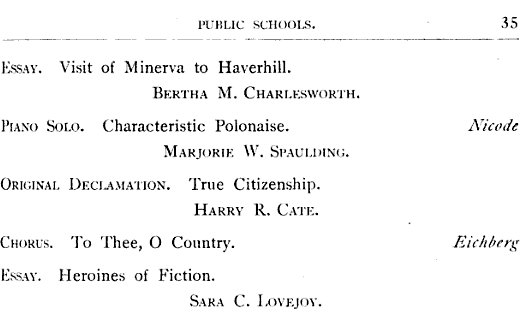 This photograph was found with those of five other Class of 1894 graduates of Haverhill High School. 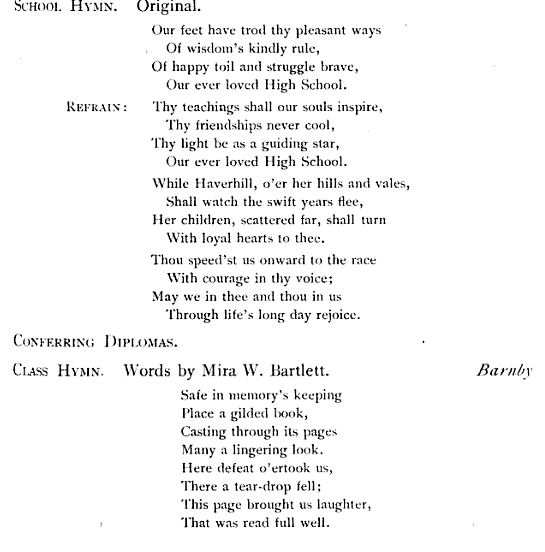 The other students are Bertha Maude Charlesworth; Amy Gertrude Foss; Jessie Mabel Gale; George E. Hutchins; and Charles Howard Nichols or George Munroe Gage Nichols. Click on the name for more information on that individual. 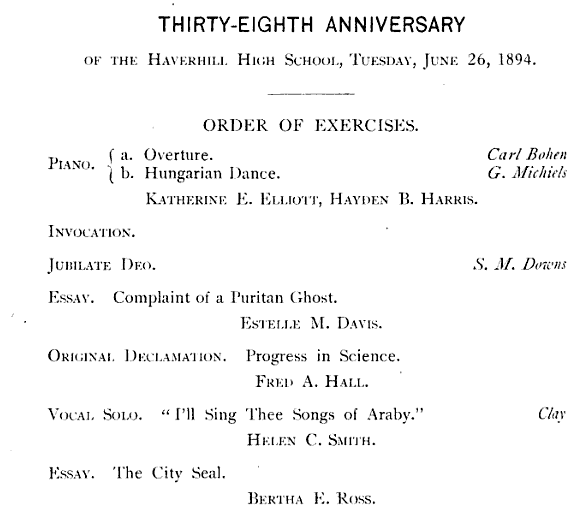 The graduation program for the Class of 1894 appears at the end of this post. Lillian Mae Pettengill was born 16 May 1875, the daughter of George Pettengill and his second wife Angie A. (Wight) Pettengill, who were born at Andover, Massachusetts, and Lunenburg, Vermont, respectively. Lillian's paternal grandparents were David and Lydia (George) Pettengill. I believe, but I'm not sure, that Lillian's maternal grandparents were Ahira and Azubah J. (Hendrick) Wight. After graduating from Haverhill High School, Lillian attended Mt. Holyoke College at South Hadley, Massachusetts. 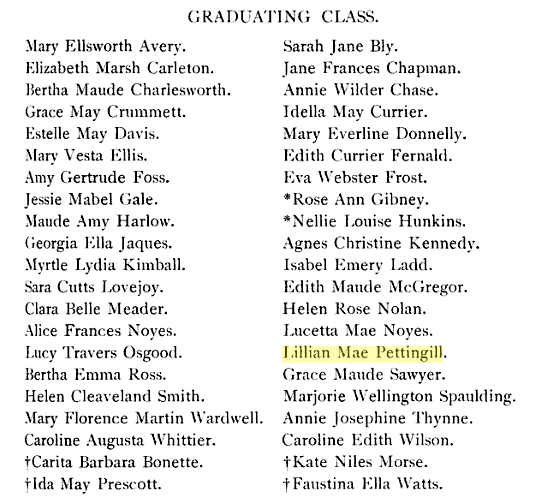 In one yearbook her name is spelled as Pettingill and in another as Pettengill. When applying for her passport in April 1918, she indicated she would be sailing that May from New York to Marseille, France on the vessel Espagne. Interestingly, the Espagne of the French line was the liner that transported my grandfather and many other Doughboys, in October 1918, from New York to Bordeaux, France, in the waning days of World War I. The Germans were told that these passengers liners would never be used for military transport, but they were. The soldiers were hidden in the hold and allowed on deck only in total darkness. It seems likely that American soldiers were hidden in the hold on Lillian's trip as well. The passengers were aware of the soldiers in the case of my grandfather's crossing and even chipped in occasionally for special treats for them. It's amazing to me that word didn't get out that the liners were being used for military transport. Passengers and crew were taking a risk. 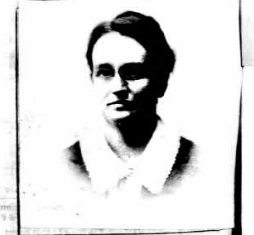 On her passport application, Lillian gave her name as Lillian Wight Pettengill, so she had dropped her middle name of Mae and taken on the birth surname of her mother as her middle name. The passenger list for the Canada, bound for New York from Marseille, indicates that Lillian returned to the United States on 10 October 1919. It appears that she did more than her share for the war effort. After 1919, I lost track of Lillian. She may have married or she may have returned to Europe. I've just finished reading Pettengill's Toilers of the Home, published in 1903. It was a fascinating read and I recommend it. 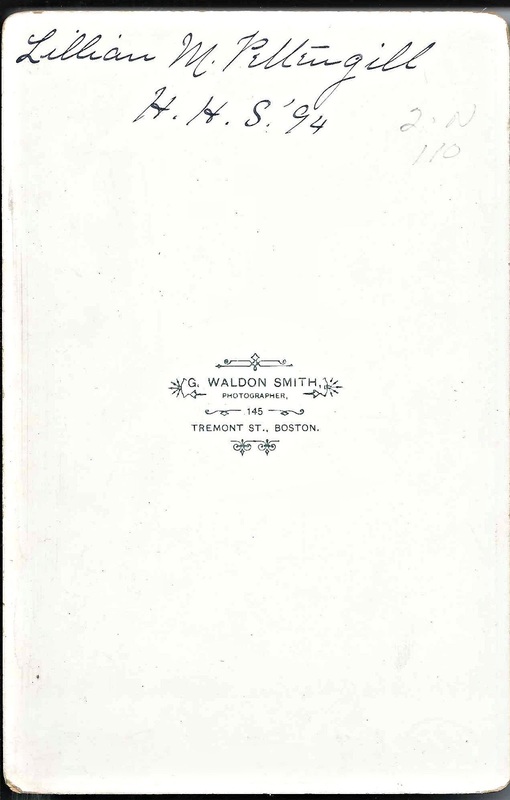 It can be downloaded at no charge from Google Books. After college, she worked as a live-in domestic servant for five different households and wrote about her travails and observations, ending with a section on changes that should be implemented by employers. It's highly anecdotal and well-worth the read for someone interested in the social history of the United States.